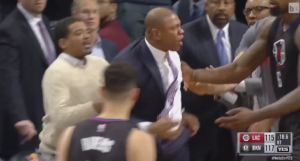 Clippers’ Coach Doc Rivers flew out of control during Tuesday night’s matchup against the Brooklyn Nets. After a technical foul call at the end of the first overtime, Rivers had to be held back from running at the refs and was ejected from the game shortly after his outburst. The Clippers ended up losing in double overtime. Nets 127, Clippers 122. 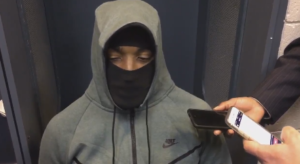 The Cleveland Cavaliers lost to the Milwaukee Bucks on Tuesday night, but the talk was J.R. Smith wearing a black ski mask during the press conference after the game. Smith said the ski mask was a gift from his trip to Ohio State last weekend, and it represents his alter ego. He said his “alter ego” has a name but wouldn’t mention what it is. After a disappointing season, the Oregon Ducks fired head coach Mark Helfrich. According to reports, it was a tough decision as Helfrich was well liked and is sitting on a $11.6 million buyout. No replacement has been named yet. The Green Bay Packers came to play Monday night against the Philadelphia Eagles. QB Aaron Rodgers stepped up his game with two touchdowns on the first two series of the game helping his team end their 4 game losing streak. The team is still way behind in the NFC North, but according to their coach, Mike McCarthy, “We look at this as a launching pad. Definitely a game we can build off of.” Packers 27, Eagles 13. Tiger Woods is set to play on Thursday in his first tournament over a year. He will play at the Albany Club in Nassau in a tournament that benefits his charitable foundation. Woods who used to be almost unbeatable at the height of his golf career has slipped to number 879th in the world. When speaking to reporters about his return, he joked “I’m not dead”. One of the greatest rivalries in college football is Ohio State and Michigan. The teams have met 113 times since 1897. All last week, the media hyped the game with articles everyday talking about Michigan coach Jim Harbaugh and his team’s tough defense and coach Urban Meyer and Ohio State’s dominating offense. The buildup did not disappoint, as Saturday’s game will go down as an instant classic. In double overtime, the Michigan Wolverines thought they stopped Ohio State on 4th down, but the refs called a first down extending the game for the Buckeyes. As Coach Harbaugh screamed from the sidelines, Ohio State scored a touchdown on the next play and won the game 30-27. In the 81st matchup of the Iron Bowl (the Alabama vs Auburn rivalry) Alabama performed as it has all season, by completely dominating its opponents. After a shaky first half, Alabama eased into a 30-12 win. With the win, #1 ranked Alabama finished the regular season undefeated for the first time since 2009. In a touching moment during the Alabama Senior Day announcements before the game, Senior Lawrence Erekosima’s mother, who is stationed in Kuwait and wasn’t supposed to be home until next year, ran on the field to surprise her son. She was allowed a leave to be with her son for this special game. Tom Brady was uncharacteristically shaky at the beginning of the New England Patriots vs New York Jets on Sunday. After a trip to the West Coast last week, plus a knee injury that kept him out of two practices this week, his passes were a bit off. Even though Brady was vulnerable, he (characteristically) worked with his team to pull out a win. He also added another stat to his resume by tying Peyton Manning with 200 career wins. Patriots 22, Jets. 17. Some things remained the same this week. In a loss to the New York Giants, the Cleveland Browns now have a remarkably disappointing 0-12 record. Browns 13, Giants 20. In the late game on Sunday night, the Denver Broncos lost in a heartbreaker when their kicker missed a 62-yard field goal in overtime, setting up the Kansas City Chiefs for a 34 yard field goal which bounced off the uprights before falling in for the win. With the loss, the Broncos will have to fight in the final weeks of the regular season to make it to the postseason. Chiefs 30, Broncos 27. Guide To Thanksgiving Day Games! In the traditional Thanksgiving day matchup, the Detroit Lions will host the Minnesota Vikings to determine the best in the NFC North division. Next up rookie phenoms Dak Prescott and Ezekiel Elliott will lead the Dallas Cowboys against their rivals, the Washington Redskins. The Cowboys are looking to extend their nine game winning streak. Redskins’ QB Kirk Cousins has another opportunity to prove to the Team they need to sign him to a long-term deal. The evening concludes with the Indianapolis Colts and the Pittsburgh Steelers. Colts QB Andrew Luck will likely not play due to a concussion he suffered last week. Scott Tolzien will start at QB for Luck. Unfamiliar with his name? That’s because Tolzien hasn’t started a game since he replaced Aaron Rodgers for 2 games back in Green Bay in 2013. Both teams need wins if they hope to secure wild card spots in the playoffs. 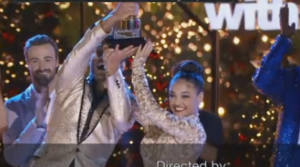 Over the summer we couldn’t get enough of Olympic gold and silver medalist Laurie Hernandez, and the judges of Dancing with the Stars felt the same way when they awarded her the winner of season 23. At 16 years old, Hernandez is the youngest competitor. In the finals, she beat out IndyCar driver James Hinchcliff and former Detroit Lions receiver Calvin Johnson (aka Megatron). The Oakland Raiders scored two touchdowns in the fourth quarter to beat the Houston Texans in a Monday Night Football game played in Mexico City. 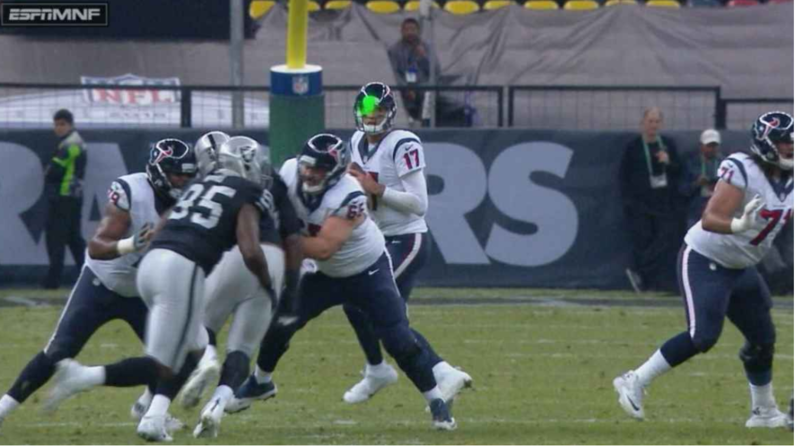 Texans QB Brock Osweiler had an odd (but seemingly legitimate) complaint after the game. Someone in the stands shined a green laser at Osweiler when he was on the field. He stated, “I’ve never experienced a laser being shined in my eyeball during a football game, let alone a professional football game in the National Football League, so I think that was certainly disappointing. But at the end of the day, that’s not why we lost the game. That was just one small factor. But it certainly affected how I was playing.” As you can see from this photo, there actually was a green laser. Raiders 27, Texans 20. With his 7th Sprint Cup Championship, Jimmie Johnson established himself as one of the greatest drivers of all time. Johnson is now tied with the legends Dale Earnhardt Sr and Richard Petty. Johnson is only 41 years old, and in motorsports he’s considered young enough to keep going and possibly grab that 8th Title next year. The Washington Redskins, led by QB Kirk Cousins’ 3 touchdowns, dominated the Green Bay Packers. Cousins has been playing on a $19.95 million one year franchise tag salary instead of a longer term salary, as the team wanted to determine if he was their quarterback of the future. After a big win against the Packers, Cousins appears to be on his way to a very large guarantee in the off-season. The Packers, on the other hand, appear to be collapsing. Sunday’s meldown marked their 4th straight loss. Redskins 42, Packers 24. In college football, the Texas Longhorns have apparently fired their coach Charlie Strong, but Strong seems to be the last to officially know. According to ESPN, reports point to Strong getting the boot, but Strong claims he hasn’t officially heard from the University. Strong has been the head coach of UT for three seasons, but the Team has had disappointing results and may not get a Bowl bid this season. 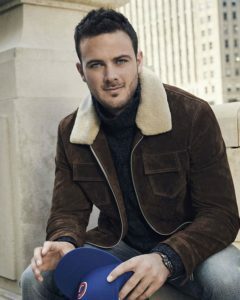 The Chicago Cubs’ Kris Bryant and the Los Angeles Angels’ Mike Trout walked away with the Most Valuable Player awards for the National and American Leagues respectively. Bryant is building quite the resume. Last year he earned rookie of the year honors becoming only the 4th player in history to earn rookie of the year then MVP in back to back seasons. Trout had an amazing season as well, but his team didn’t fare so well, which made his award all the more surprising. The last player to earn an MVP on a losing team was when Alex Rodriguez played for the Texas Rangers in 2003. For most of the game, the Carolina Panthers dominated the New Orleans Saints in Thursday night football. The Panthers Defense sacked The Saints QB Drew Brees three times keeping him out of the end zone. In the 4th quarter, however, the tide started to change. The Panthers suffered some injuries and started to unravel, while the Saints began their comeback. Thanks to a big gain of yardage from Panther’s QB Cam Newton, Carolina was able to hold on to a 3 point lead and win the game. Panthers 23, Saints 20. In the college ranks, #3 Louisville had a chance on Thursday night to impress the selection committee for the college football championship, but instead embarrassed themselves on national TV in a big loss to the Houston Cougars. Houston 36, Louisville 10. 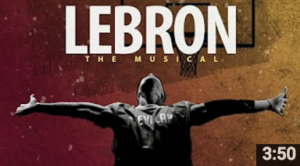 LeBron James donated $2.5 million to the new Smithsonian National Museum of African History and Culture for the Muhammad Ali exhibit. 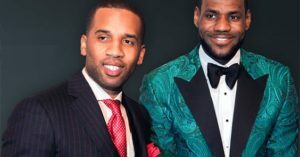 He told USA Today, “Muhammad Ali is such a cornerstone of me as an athlete because of what he represented not only in the ring as a champion but more outside the ring — what he stood for, what he spoke for, his demeanor.” NBA legends Michael Jordan and Magic Johnson also donated $5 million and $1 million respectively to the museum. 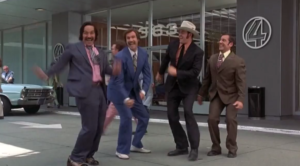 If you’re not quite over the excitement of the Cubs winning the World Series (and if you’re a fan of Will Ferrell and Anchorman), “Funny or Die” put together a great mashup. QB Tom Brady is having some fun at his own expense with the “Week of Greatness” ads from Foot Locker. 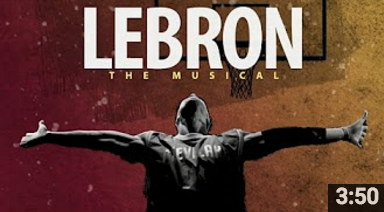 There’s also a great ad making fun of Carmelo Anthony. Tony Romo will officially return to the Dallas Cowboys on Sunday but as a backup QB to Dak Prescott. An emotional Romo told the press “He’s earned the right to be our quarterback. As hard as that is for me to say, he’s earned that right. He’s guided our team to an 8-1 record and that’s hard to do.” Romo turned the reigns of the team over to rookie Prescott in August after he hurt his back. For the full text of his very classy statement, click here. The Manager of the Year awards were handed out in Major League Baseball and to no one’s surprise, Terry Francona was named the American League Manager of the Year. Not quite so obvious, however, was Los Angeles Dodgers’ Manager Dave Roberts getting the nod for National League Manager of the Year. Many thought the honor would go to the World Series Champs Joe Madden of the Cubs.